OSWEGO, NY – Recognizing Oswego County’s theme for November is Senior Support. This month, the group focused their lens on efforts within the community to engage with and improve the lives of senior citizens. Residents of Morningstar Nursing home and SUNY Oswego’s Adopt-a-Grandparent Program look on as program coordinators Renee LaFreniere and Kayla Kelly (bottom left) receive the November Community Champion award from ROC member Penny Morley (bottom right). 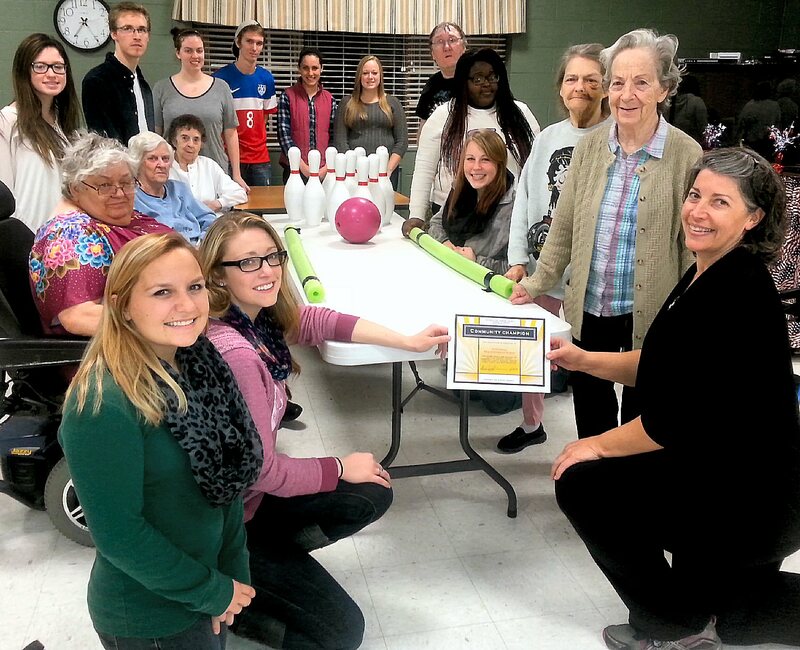 Adopt-a-Grandparent, an all-volunteer, student run group at SUNY Oswego, was chosen as the Community Champion for November. In discussing the importance of connecting with our senior population, ROC co-chair Penny Morley noted that as the population ages we need to ensure that we are creating a system that allows us to age better. “Now, more than ever, young people need to become more engaged in supporting seniors. Adopt-a-Grandparent does just that,” Morley said. Recognizing Oswego County focuses on the positive efforts that are being made in the community. Each month ROC uses this recognition effort as a platform for emphasizing the wonderful work that is happening in Oswego County to promote the health and wellness of children, families and adults. Adopt-a-Grandparent is housed under the Service Learning and Community Service department at SUNY Oswego, but is completely run by students. The group is currently coordinated by Renee LaFreniere and Kayla Kelly and has 68 student volunteers who visit seven senior residential communities in Oswego and Fulton throughout the school year. So far this semester, they have logged more than 700 hours of service participating in weekly activities like bingo, bowling, arts and crafts, cards, painting nails, adapted sports, and other fun activities. At the end of the year, they throw a Senior Ball with catered food and live entertainment. According to LaFreniere, everyone dances and has a great time. “The program creates a connection between the college and the seniors. We learn so much from them,” LaFreniere said. Each month, ROC selects a theme and invites guest speakers to share the good work they are doing. Nominations are also solicited for Community Champions. For the month of December, Recognizing Oswego County is seeking nominations in the area of Outdoor Winter Recreation. A potential nominee might be an individual that coordinates an outdoor community event or activity. Nominations are due by December 10. ROC members include representatives from a broad range of community organizations as well as individual community members. Monthly meetings are held from 8-9:15 a.m. on the second Thursday of the month at the Oswego County Federal Credit Union, 90 E. Bridge St.